Need a "hassle free" fencing contractor for your school. Our experience has taught us that schools and the person in charge of school maintenance, are looking for reliable contractors with professional and courteous staff. Polite and professional on-site staff. A tidy and safe work-site. Clean-up and removal of excess materials. A fence constructed to AUSTRALIAN STANDARDS. SAS Fencing has a wide range of School Fencing options to suit your Schools budget and requirements. We have a number of chain wire and tubular steel fencing and gate solutions. To determine what's the best solution for your Schools needs, contact SAS Fencing and our helpful advisers will come to your school for a free measure and quote. FOR MORE INFORMATION OR AN URGENT REPAIR! 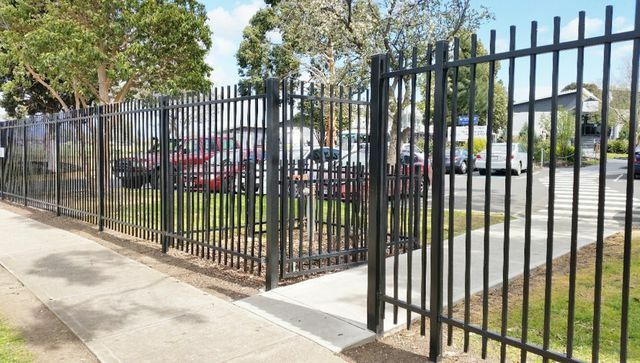 SAS Fencing offer a wide range of Commerical, Industrial and School Steel, Metal and Wire Fencing and Gate Solutions to most of Melbourne's Northern, Western and Eastern Suburbs including: Airport West, Albert Park, Albion, Alphington, Altona, Altona Meadows, Altona North, Ascot Vale, Avondale Heights, Balaclava, Balwyn, Bayswater, Bentleigh, Blackburn, Box Hill, Braybrook, Brooklyn, Brunswick, Brunswick Nth, Brunswick West, Bulleen, Bundoora, Cairnlea, Camberwell, Camberwell East, Cambellfield, Carlton, Carnegie, Caroline Springs, Caulfield, Chadstone, Chirnside Park, Coburg, Coburg North, Clayton, Collingwood, Craigieburn, Dallas, Deerpark, Derrimut, Docklands, Doncaster, Donvale, East Melbourne, Elsternwick, Eltham, Elwood, Essendon, Fairfield, Fitzroy, Flemington, Footscray, Forest Hill, Glenroy, Greensborough, Hawthorn, Heidelburg, Hoppers Crossing, Jacana, Keilor, Keilor East, Keilor Downs, Kensington, Lalor, Laverton, Laverton North, Maidstone, Maribyrnong, Melbourne CBD, Melton, Mont Albert, Moonee Ponds, Newport, Northcote, Oak Park, Oakleigh, Parkville, Prahran, Preston, Preston West, Rockbank, Seddon, Somerton, South Yarra, Southbank, St Kilda, Sunbury, Sunshine, Sunshine North, Sydenham, Thornbury, Toorak, Tottenham, Werribee, Werribee South, West Footscray, Williamstown, Wynham Vale, Yarraville and more.